The contacting extensometers are designed for accurate strain and extension measurement of a material up to a maximum sample thickness of 25 mm. We provide a wide variety of contacting extensometers in just the size you need. 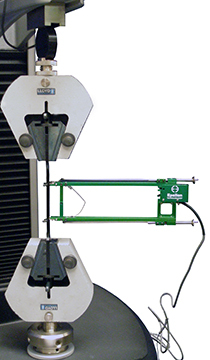 Our general purpose, precision extensometers are designed for testing a wide range of materials including metals, plastics, composites and ceramics operating in tension, compression and cyclic testing modes. Its dual flexure design means a higher frequency operation is permitted, while eliminating vibration sensitivity at the same time. Each extensometer is supplied with an attachment kit to allow quick one-hand mounting to the sample. For more information about our range of contacting extensometers please see the Epsilon Extensometer Catalogue.